The installation meeting of Fraternity Chapter No 4072 saw Malcolm Clifford return to the first principal’s chair for the fifth time. The representative of the Grand Superintendent Tony Harrison was grand officer Ian Greenwood, accompanied by Assistant to the Provincial Grand Principals Chris Butterfield, the Preston Group Vice Chairman Geoff Saul together with fellow grand officer Joe Collier and supported by acting Provincial grand officer Peter Ledder. Ian Greenwood (left) congratulates the three principals on their preferment. Unfortunately, due to illness and circumstances, the elected first, second and third principals were unable to attend the installation meeting. 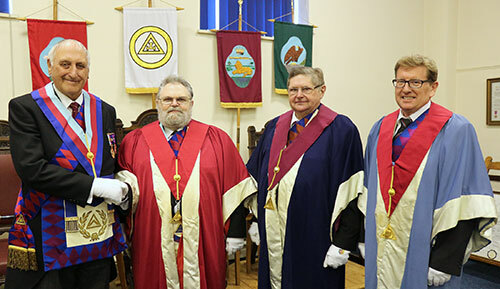 As a result, and at very short notice, lodge members Chris Butterfield, Malcolm Clifford and Robert Smith stood in as the acting first, second and third principals respectively. The chapter was opened by the three acting principals in the customary manner and the administrative business of the chapter concluded in a timely manner. The DC John Stansfield requested permission to retire from the chapter for a short period before returning to announce the presence of Ian Greenwood as the representative of the Grand Superintendent. Ian entered the chapter in due form accompanied by other grand and acting Provincial grand officers to be welcomed by Chris who wished him an enjoyable evening in the chapter. For the purposes of installation, Bob Cadman temporarily occupied the chair of the third principal. The installation itself commenced with the chapter member Stephen Read being presented to the third principal for installation as the new third principal of the chapter. Bob responded by delivering a full ceremony in preparing Stephen for his chair. Robert Smith was in turn presented to Malcolm Clifford for installation as the second principal. Similarly, a full ceremony ensued in preparing Robert for his chair. Paul Astley temporarily occupied the chair of second principal to allow Malcolm, in turn, to be presented to Chris Butterfield for installation into his chair as the new first principal. During this part of the ceremony, Chris took the opportunity to thank all the companions of the chapter for their support in what had been an unusual and challenging year for the chapter. As Malcolm had held the office of first principal on a previous occasion, Chris concluded by placing Malcolm directly into his chair of office. In each case the presenting officer was Joe Collier with the relevant scripture readings, and associated prayers being given by John Whittall. Companions below the rank of an installed principal were invited to retire from the chapter for a short while whilst a conclave of installed principals was declared during which the second and third principals were, in turn installed in their respective chairs. The conclave was then closed and the companions invited to return. The three principals were then proclaimed by DC John Stansfield as first, second and third principals of the chapter respectively. The scarlet robe address was eloquently presented by John Whittall, the purple robe address in equal manner by Alan Eastham and the blue robe address in similar style by John Stansfield. Malcolm appointed his officers in an expeditious manner during which, following his appointment as charity steward, John Stansfield was addressed by the Preston Group Charity Steward Vic Parker. Vic took the opportunity to thank the previous incumbent of the office, Alan Brown, for his 10 years sterling service in that position. The address to the three principals was delivered in an excellent manner by Joe Collier and that to the companions of the chapter by the principal guest, Ian Greenwood. At the conclusion of the ceremony, Ian rose to bring the congratulations of Tony Harrison. He congratulated the three principals on their appointment and the work of Chris Butterfield as the acting first principal. He went on to congratulate all the companions for their support in what had been a testing year for the chapter and gave particular mention of those who had a part to play in what had been an excellent ceremony, wishing them well for the ensuing year. Malcolm, in turn, rose to thank Ian for his kind and generous comments and had the pleasure of presenting him with a cheque to the value £90 in support of the West Lancashire Freemasons’ Charity. Later in the evening, in response to the toast to the grand officers, Ian congratulated the three principals on attaining their respective chairs. He continued by thanking Chris Butterfield for standing in as the installing first principal at short notice and congratulated him on the excellent manner in which he had discharged the duties of that office. He continued his congratulations by referring to the excellent work of John Whittall, Alan Eastham and John Stansfield in delivering their respective robe addresses. Turning to the chapter members, he commended all of them on the way they had worked through what had proved to be a testing time for the chapter. Moving on, Ian encouraged the companions to give their full support to the MCF 2021 Festival and thereby, the Masonic Charity Foundation. He reminded everyone that in receiving support from the grand charities, the Province of West Lancashire was a net beneficiary to the tune of around £1,000,000 per year. He urged those who had yet to make a pledge in support of the 2021 Festival to consider doing so, adding that the cost is currently 25 pence per day. He went on to say that in its first year of operation, the Festival had raised around £1,750,000. Continuing with the charitable theme Ian thanked the chapter for the £90 donated to the WLFC earlier. He went on to say that, although charitable donations are an important part of Freemasonry, companions should not forget to maintain support for their Masonic halls. In particular he thanked Malcolm Clifford and John Whittall for all they have done and continue to do in the running of Preston Masonic Hall. With regards to increasing numbers in Freemasonry and thereby numbers in the Royal Arch, Ian referred to the ‘Ambassadors Scheme’ specifically created to promote awareness of Freemasonry and correct the misperception of the Craft currently held by members of the public. He concluded by thanking Geoff Saul and Peter Ledder for their support in attending the meeting. Pictured from left to right, are: Joe Collier, Peter Ledder, Ian Greenwood, Robert Smith, Malcolm Clifford, Stephen Read, Chris Butterfield and Geoff Saul.